June 6, 2018 (San Francisco, Ca.) 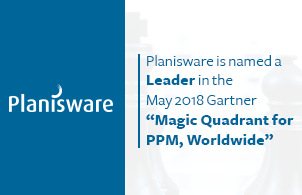 – Planisware – a global provider of Project and Product Portfolio Management (PPM) software solutions for new product development (NPD) organizations, project control and engineering, and IT businesses – was positioned as a leader in Gartner’s recent report, “Magic Quadrant for Project Portfolio Management, Worldwide.” The full report can be accessed here. Planisware offers PPM software that supports business processes across the enterprise, from building a strategy to planning to execution. The company’s customer base is comprised of hundreds of thousands of users worldwide, representing several different industries, including consumer packaged goods, IT, engineering, automotive, aerospace and defense, high-tech, chemical manufacturing, life sciences, and energy. For more information about Planisware, please visit www.planisware.com or call 888-752-6479. Planisware is a global provider of Project and Product Portfolio Management software solutions. Planisware's acclaimed, built-in best practices and out-of-the-box solution accommodates the company's customers across a variety of industries and empowers users to align the solution with key business programs and portfolio management processes. To learn more about Planisware, please visit www.planisware.com or call 888-752-6479.